A leisurely start saw us leaving Glasgow just after 10:30am, the Loch Lomond road was surprisingly clear as we trundled towards Arrochar. It looked like we had missed the best of the weather as the cloud got lower and thicker as well as the light fading. We parked at the car park opposite Succoth and started up the amazingly good new path. It was cold but we soon started to get warm with a double layer of Merino on. We hit the snow line just at the weir, but the track was easily identified by the neat compacted snow from all the boots before us. Just past the boulders we bumped into the Culture & Sport Glasgow walking programme, Pat smiled and suggested that I was checking up on him. Just at that a group of 4 passed us with Inov8 trainers and clad in Lycra running back down the hill. 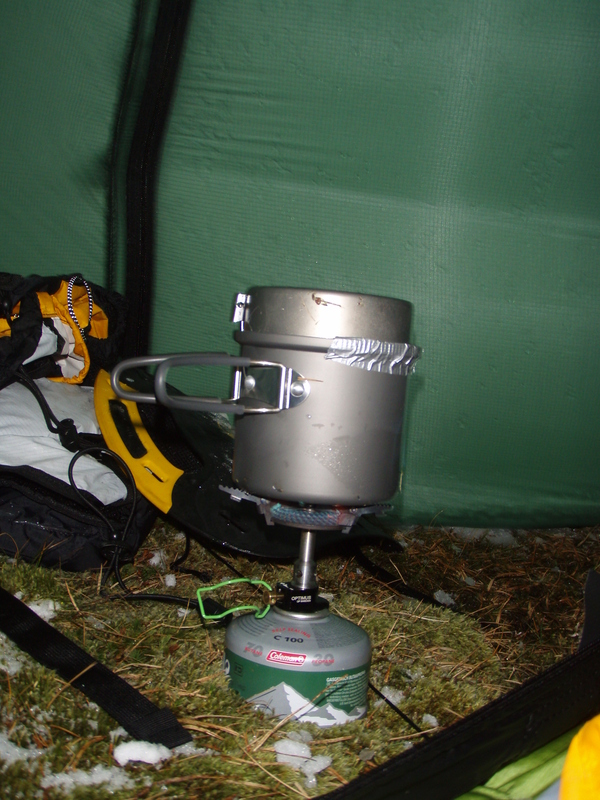 I climbed up to the lochan and Julie decided she had had enough, I got the stove out for a brew and a chew on some chilli beef jerky, it amazes me how just a couple of slices kills the hunger and keeps the belly happy. 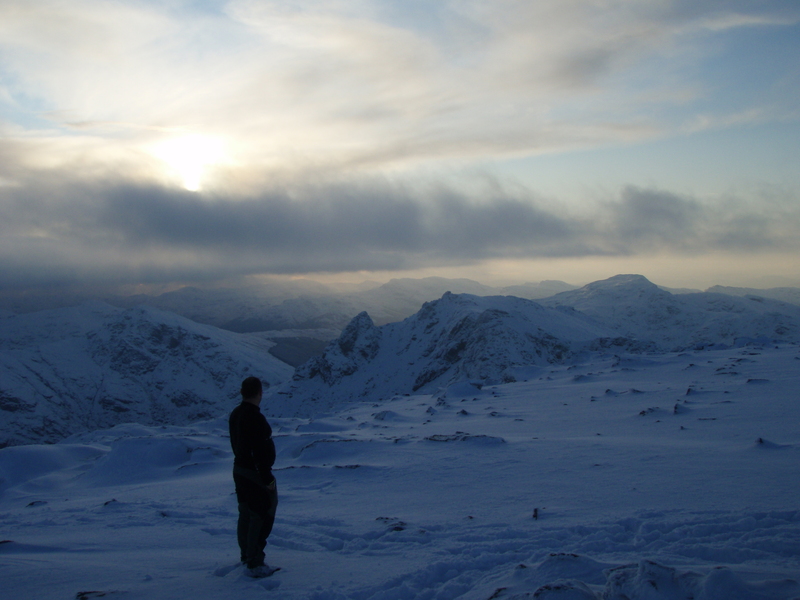 I was still undecided, Ben Narnain or The Cobbler or boost back down and catch up with Julie ? 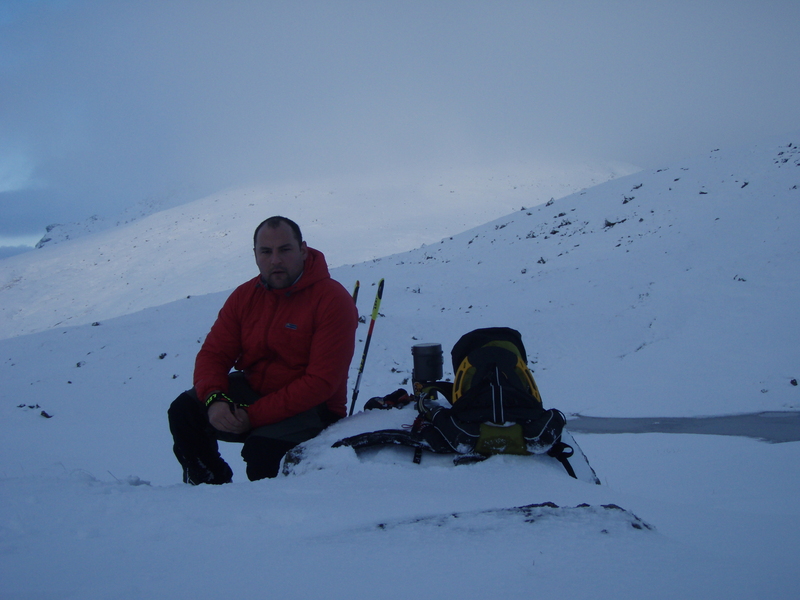 I have been up the Cobbler a few times and had to retreat of the sided of Narnain twice denied of the summit. The sky cleared and the light changed, Narnain it is. The snow got deeper as I left the compacted path and headed up the shoulder, at that point I cursed at not putting gaiters on. I had my Montrail Cirrus on which are a great boot for the very conditions, I love them to bits but just hate the fact that the alleged waterproof membrane is as waterproof as a kitchen colander ! The slightly heavier boot and stiffer sole lends itself so well to winter conditions. I struggled on up the shoulder as the cloud lifted, you could see for miles in all directions with snow coated peaks sticking up every where! It really does not get any better than this. 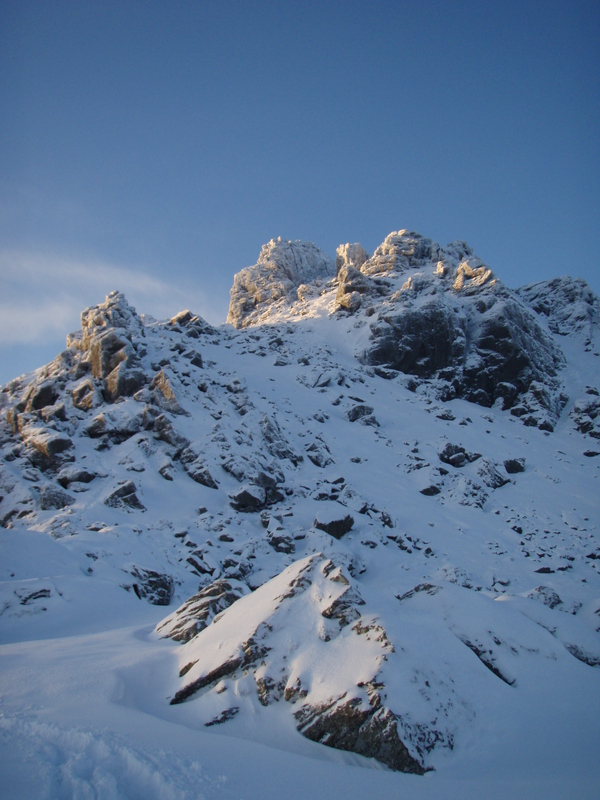 As I arrived on the summit the sun was casting a red and orange glow across the white of the snow. As I stopped to take a photo at the trig point the couple that had left the car park at the same time appeared from the SE side, they had headed straight up for the summit at the weir and commented on how icy it was coming through the exposed crags just before the summit. They disappeared of the way I came up as I debated which route to go for. I noticed at the trig point there was a flat spot with a small line of stones I pondered and thought “yes that is a perfect Triple Wire bivvy spot ” (PTC you have a lot to answer for !). 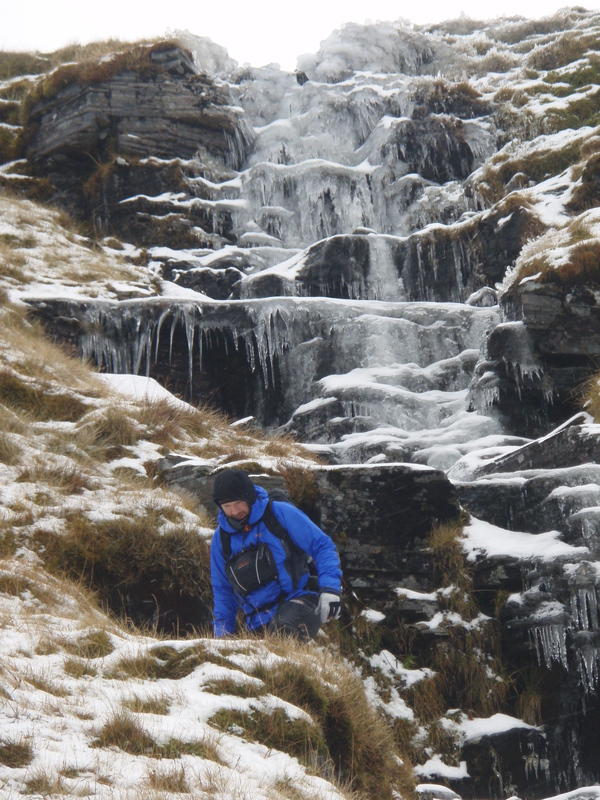 I headed of down the SE shoulder and after 5 mins found my self having a Bear Grylls moment having to down climb some very icy rocks. Past that I dropped into knee high soft snow and looked back for a photo. 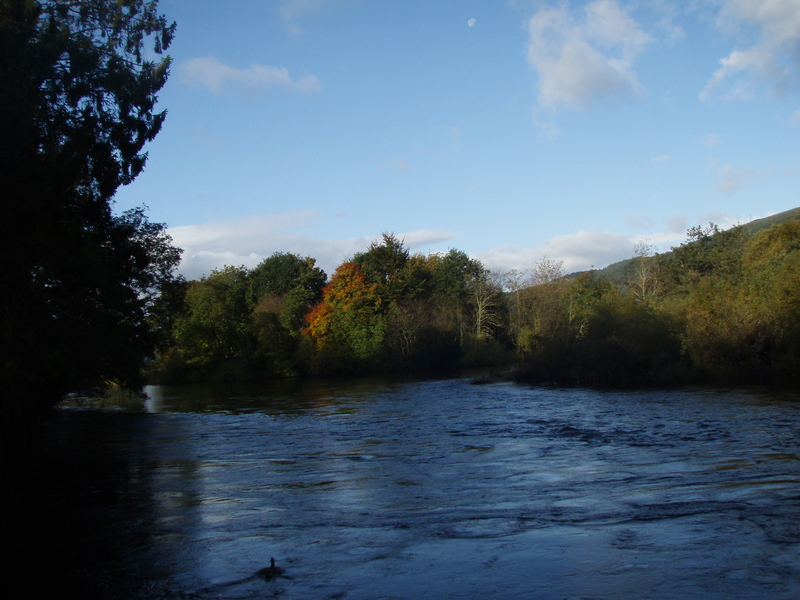 As I got back to the path at the weir I passed a few people with big boots and what looked like 60 lts packs on walking down the hill. Back at the car for 4 just as the light faded and the air got that wee bit more nippy ! Weather is looking pretty good for the weekend. So I will probably just stay in ! You kids play safe now ! Kick off was 10:30 at PTC HQ so I left the house fueled the car up and started to head to Bridgeton to pick wee Brian up, it was good to think there would would be a few people heading out to test the tents. I got a call from Brian saying he wasnt going and that he would let PTC know ! 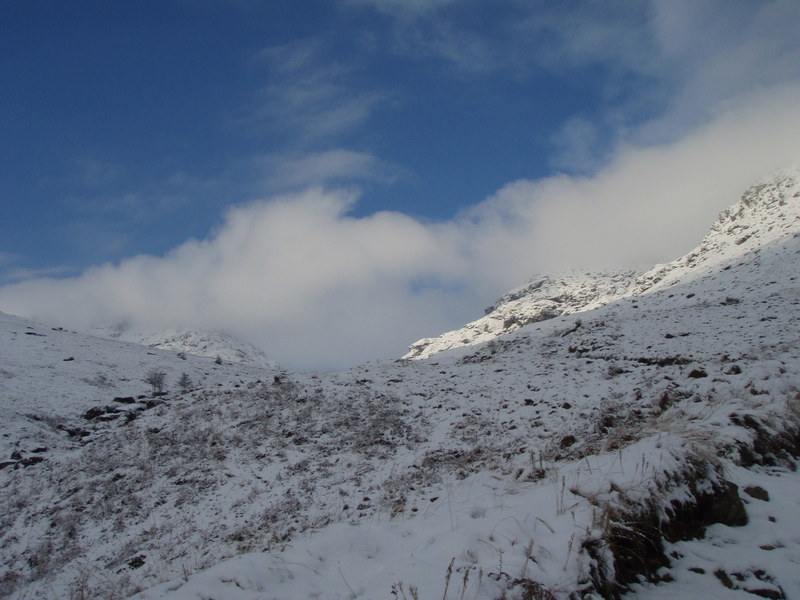 I arrived at the meet point early and sat listening to the radio with the forecast of snow blurting out ! PTC turned up announcing that just about everybody had cried off for various reasons. We selected a tent each (well PTC took the one he wanted and then gave me a choice !) I ended up with the Hilleberg Soulo. The gear was chucked into the truck and we left heading North. We stopped off at the Real Food Cafe to see if anyone else would turn up but no one showed as we got stuck into the amazingly massive Big Breakfast roll. We decided to ascend from the North side as it was a bit shorter and very scenic. 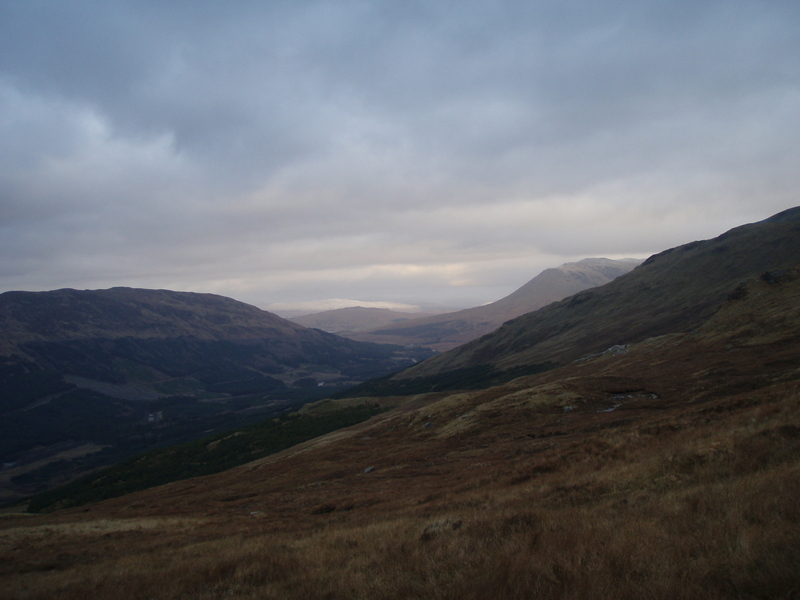 We climbed up the shoulder of MeallGarbh with solid ground under our feet frozen by the nippy air ! Both of us were breathing through snot filled lungs which slowed us down big style ! This is the first time I have been out since the WHW and I really felt it physically as well as being slightly cautious on left foot placement. A few stops to enjoy the view helped to catch the breath as the hill side got steeper and steeper in front of us. We arrived on the summit as the light was starting to go and set to pitching the tents, one thing I will say for the Hilleberg is that even without instructions it is very easy to pitch. I inflated my clearview pad with a bit of a struggle as breathing through my nose was slightly problematic ! Second time this year being ill in the space of a couple of months really is doing my head in ! Pad inflated and sleeping bags lofted it was time to get some photographs of this almost perfect camp spot. Looking back on the photo above I don’t remember it being that dark ! it is good how the body adjusts to changing conditions. It didn’t take me long to get my kit sorted in the tent, the joy of having space after using the 3 wire bivvy is amazing and really started me thinking if the 3 wire was the best choice, much as I love it ! 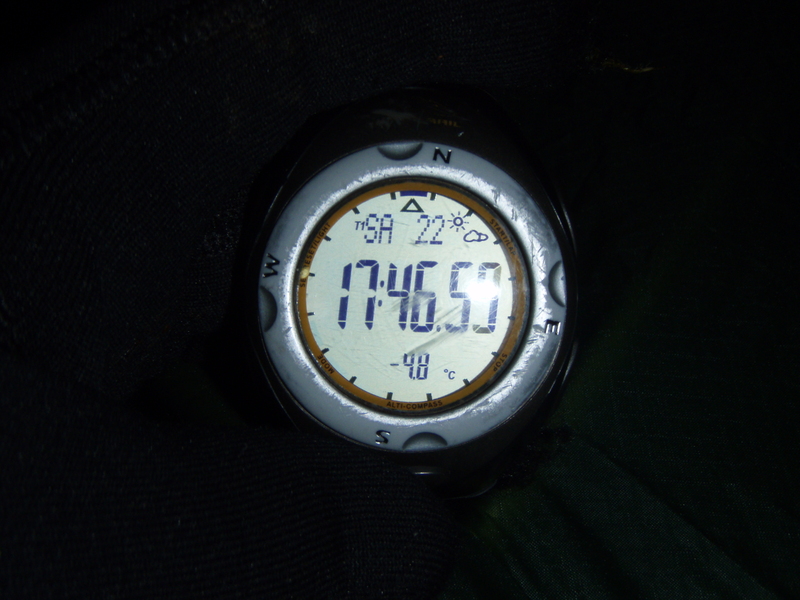 The temp was starting to drop from when we stopped, I took my watch of my wrist when I pitched the tent and it had the temp on my wrist as 13 degrees C.
5 minutes later with it sitting on the tent it showed a different story ! I walked down to the lochan to get some water for a brew,the ice was fairly thick and I had to break it to get my mug in, the major error was I broke the ice with my muddy boot causing all the crap of the day to mix with the water “TUBE” , I moved spots and hacked a mug size hole with my knife this time being carefull to get clean water. We sat with a brew and chatted, PTC playing with all his new down kit. A toasty man is a happy man ! 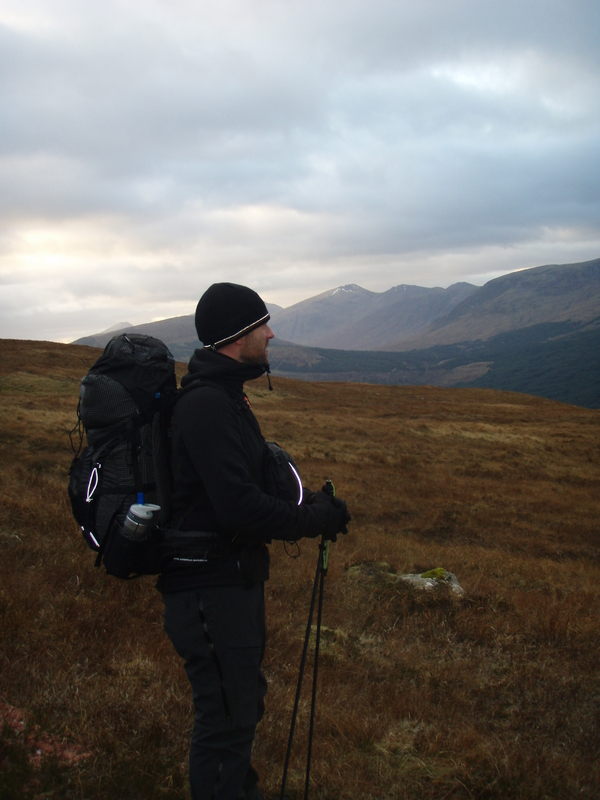 I had my Montane Extreme Smock on which does not get worn much normally as I just find it too warm, in this case it was perfect but bulky. 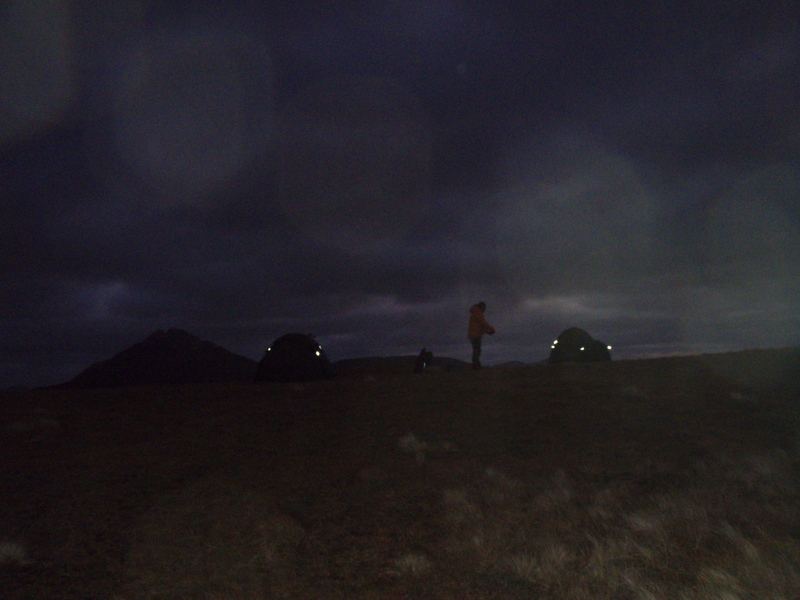 We had a wonder about the hill for a bit and tried to pick out lights in the distance and generally just stood in the dark absorbing the atmosphere of the mountains at night, it was so quiet and still with no wind, oh how things were going to change. I was still trying to digest the breakfast roll from the Real food cafe but we decided to have a bit to eat, I boiled some water for my dried beef and noodles, once that was done I put another brew on to keep me content for the 10 mins it would take for dinner to re constitute itself. I had rice pudding as well which just well and truly stuffed me full ! I climbed into my bags and read my book for a while and then dozed of about 10pm. I woke up later with the wind blowing against the tent, but the direction had changed from northerly to southerly. I felt a bit cold from the ground side so slipped the mat from the OMM Classic under the clear view whilst cursing that I had taken my foil sheet out my rucksack as that would of been ideal. I slipped back off to sleep with the wind gusting against the tent. I woke up at approx 3am to the wind howling against the tent whilst airborne ice particles blasted the outside of the tent. I unzipped the inner door to find the porch full of snow and cursed at my self for not putting my kit away properly. At this point I opened the outer zip at the top of the door to have a peek outside and was greeted by a blast of the same stuff that I heard hitting the outside of the tent. At that point PTC stuck his head out to say he was roasting and was I ok, I shouted back that I was fine and took another picture. 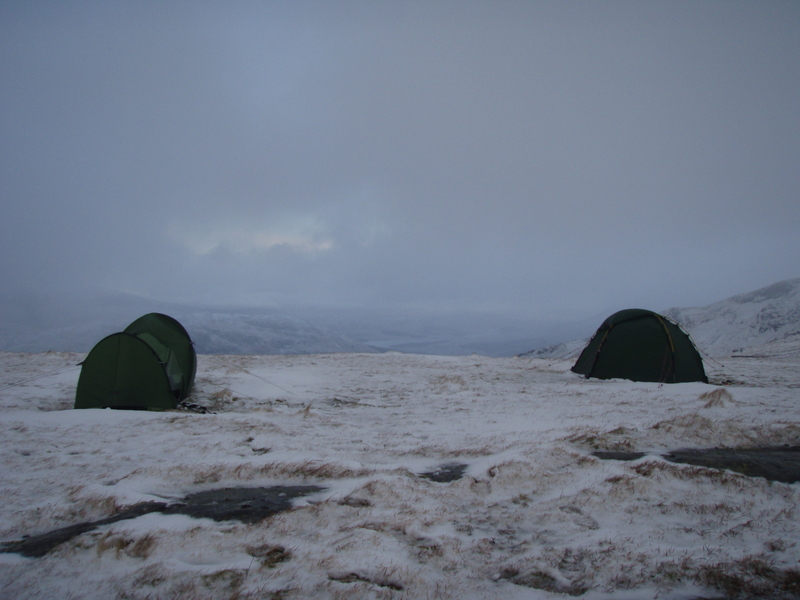 We laughed and I locked myself back into the tent snuggled down into the two bags and turned my Ipod back on, I cant say I really slept it was more a relaxed doze if anything as the tent got battered by the now angry wind. About 7am it started to get light and I stuck my head out the door again, the cloud was down and I muttered to my self that there would be no spectacular sunrise and went back to sleep for an hour. 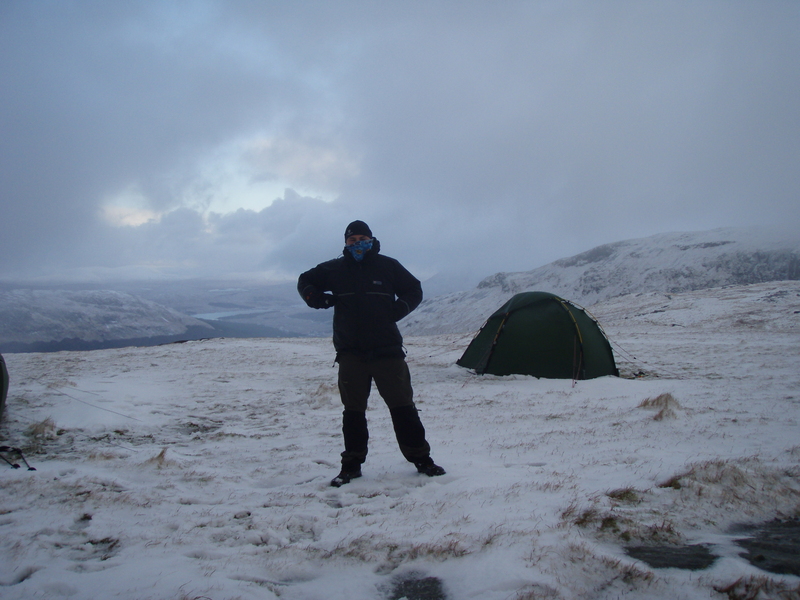 About 8 ish I had to submit and venture outside to use the loo with a view, I jumped out with just long johns and thermals on and my boots untied, just as I departed the tent PTC had had the same idea ! 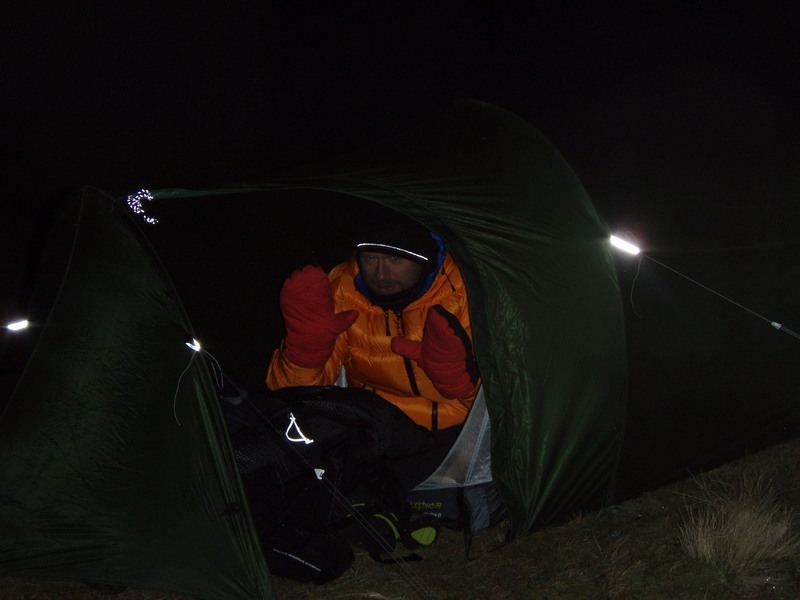 By the time I jumped back into the tent my teeth were chattering despite the fact it was a good couple of degrees warmer than the evening. I put a brew on with a mixture of the slush in my water bottle and some clumps of snow from the porch, it was still windy out so I kept the porch door closed. I packed everything up whilst drinking my coffee got dressed and ventured outside with just about every bit of clothing on I had with me. I had debated what the best way of getting the tent down without it inflating like a parachute and dragging me across the summit ! 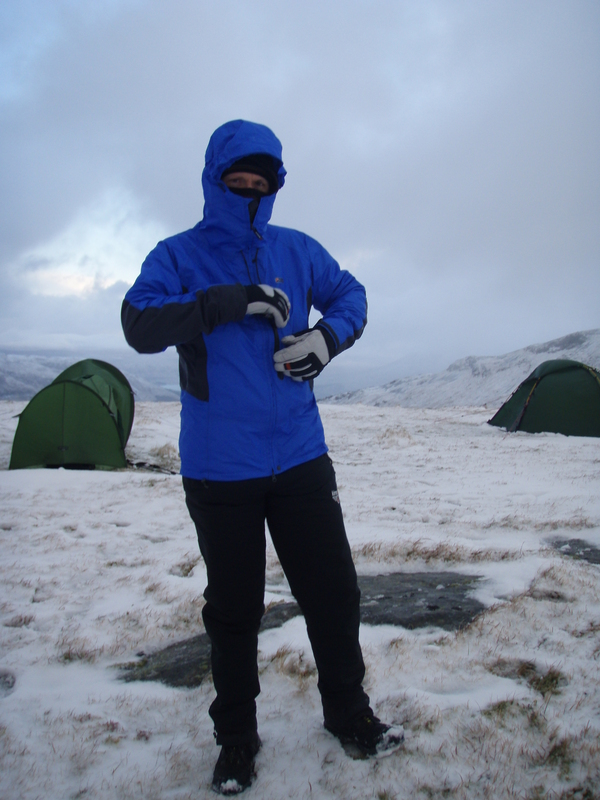 In actual fact the worst bit was my Mountain Hardwear Power stretch gloves got wet with the slush on the tent and my hands started to get cold so I stuck my marmot Wind stopper gloves on and was a happy bunny again and glad that I had brought a spare pair with me. I just stuffed the tent straight into the top of my rucksack as tidy packing was not going to be an option in this wind ! We started down the hill using the poles to stop us sliding on our arses as the ground was wet and the snow was starting to get slushy. Back at the car the rain was falling and the snow was slushy and horrible, this just compounded the feeling that the weekend was over and Monday morning at work was just around the corner. We stopped of at The Real Food Cafe and cheered ourselves up with rolls and massive mugs of coffee before hitting the joy of the Loch Lomond road and then back to the big smoke for a bath and a roast dinner. TOP GEAR IS ON BYE ! There is a mision Imenant ! Tent testing in November !!!!! Why yes PTC that sounds great ! 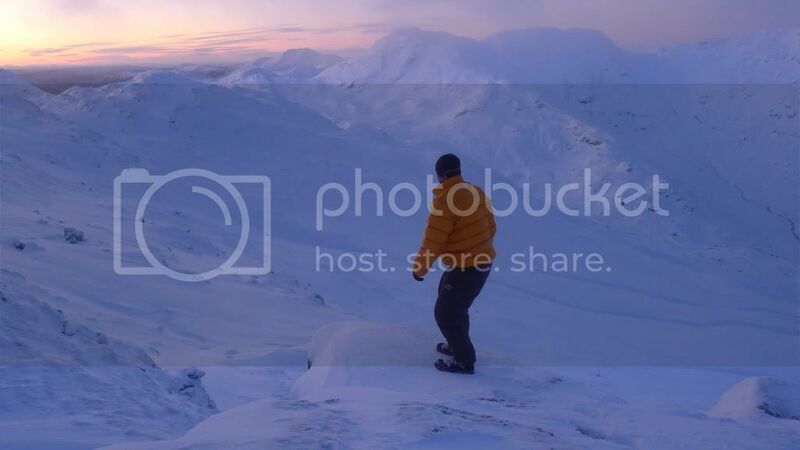 – degrees cellsius and a camp above 800m to ensure good photies. Only problem is all my light weight kit aint rated for that temp so decision time ??? 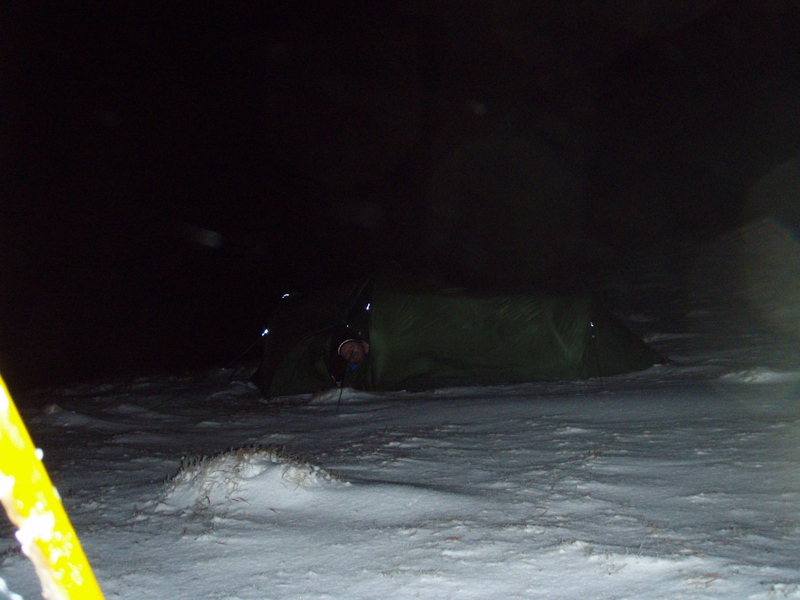 Go heavy with a synthetic bag or go light with Big Agnes top bag and sleep in clothes in the hope I dont slip intyo a Hypothermic coma in the early hours of the morning ! Watch this space for an update on Monday ! MAYBEE !